When it's time to serve high tea, missing sugar cubes create a disaster for the white duck with pink earrings who owns Mabel's Tea Room. "Unable to settle on an afternoon activity, Jack and Bunny head to Mabel's Tea House for high tea, featuring cookies and cucumber sandwiches. 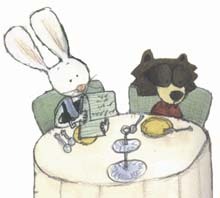 However, for this Raccoon and Rabbit detective duo, tea is not complete without sugar cubes. Who could have taken them? The sleuths go to work! Narrator William Dufris mimics detective dramas of old by exaggerating both words and pauses while understating each turn in the story. He creates distinct characters--crafty Bunny; predictable Bear; dramatic Mabel; Louis, the unsuspecting ferret father; and gullible Louis, Jr. Now, who HASN'T made an igloo out of sugar cubes?"